Does this conversation need “both sides”? In our work, we’ve needed to consider what kinds of conversations are healthy and what are abusive bad-faith debates. We’ve come up with some ways to think about the problem and decide the best steps to take. Those steps might include continuing the discussion, adjusting the rules for conversation, or stopping things entirely as to prevent further harm. While speakers in the U.S. use the concept of “free speech” as an excuse to share offensive, hateful, and even harmful speech, the real beauty of the right to free speech is our ability to refuse to listen. While anyone can say (almost) anything they like, they have no power to force us to listen to their words. Ultimately, everyone’s right to free speech extends only to the point where it endangers my right to life, liberty, and the pursuit of happiness. While telling harmful and healthy debates apart isn’t as simple as referring to a spotter’s guide, reviewing the circumstances of a conversation (including who has power), as well as how participants have acted in the past, can give you an instant gut reaction. With a little practice, you can tell if a specific somebody’s speech is going to require you to schedule appointments with your therapist. How can we put this to use? Let’s talk about a hypothetical situation: Joe Less is a speaker covering standard alt-right talking points, like claims that women are biologically unsuited to technical work. That argument right there throws up red flags — not just because his argument runs counter to the evidence on hand, but because he’s focusing on the rights and abilities of an entire demographic group. Our hypothetical speaker is a man, with commensurate privilege and power in our society, offering another red flag: attacking groups with less power is almost always harmful. If we research our hypothetical speaker’s background, we may have our instinctual reaction confirmed: I’d look for reactions to other talks by the same speaker, litigation against organizations dedicated to social justice, and examples of physical harm. In less hypothetical circumstances, I’ve seen that a lot of people willing to use hate speech are also willing to use physical violence. Accepting a debate with someone like this is risky. You need to choose how much risk to expose yourself to. Depending on the circumstances, you may be faced with debates you can’t walk away from. Lots of us have that one right-wing relative who can’t wait to corner you and talk about how they want anti-immigration or anti-abortion legislation. Though it’s not comfortable, you might decide the risk of getting into a shouting match at family events is worth extending yourself. But other situations take more consideration. You have to evaluate who you will listen to and work with. After all, there are some people who can work on issues together while holding extremely different points of view. But some people can’t: they come in refusing to act in good faith. Good faith is the litmus test when it comes to listening to both sides of an issue and to working together. Yes, these evaluations and assessments are work. I expect the most work from people in positions of privilege and power, because people with privilege have more resources to work on these issues. And, frankly, someone in a position of power, such as the administrators of universities that our hypothetical Joe Less might speak at, have the most power to make quick changes, like shutting down a talk that could cause harm to members of the student body. For those of us not running universities or other large organizations, there’s still work we can do. Focus on the biggest impact you can create: convince leaders in your organizations and communities to support healthy debates, rather than making space for harmful speech presented in bad faith. Need some ideas about how to handle these conversations in your workplace? We made you a handy guide! This includes a page you can post for others to read, and second part to support your ally efforts and self-care. Download Healthy Debates and Discussions. Learn more tools for these conversations from our book, The Responsible Communication Style Guide. 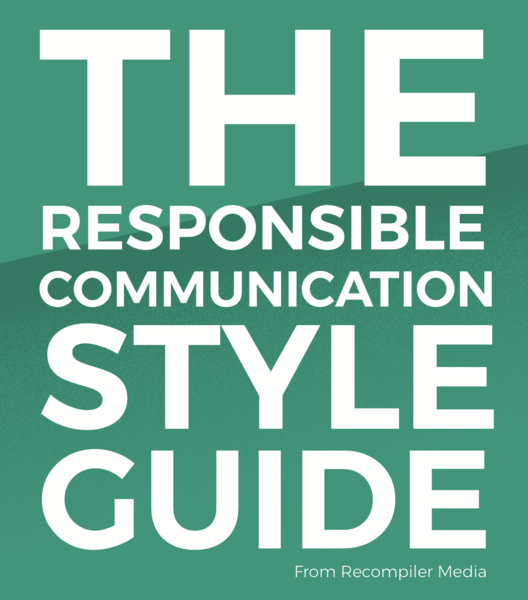 The Responsible Communication Style Guide is headed back to the printers! The Responsible Communication Style Guide gives you the tools, techniques, and terminology to write inclusively. Available in both print and electronic books, this guide covers race, gender, sexuality, well-being, and religion. It’s the desk reference you need to interview someone about their identity, write accessible documentation, and write inclusive copy. While sharing a copy of The Responsible Communication Style Guide with your team is a good start, we can help you create a more inclusive editorial workflow. Through our organizational training, we can bring your whole team current on inclusive writing techniques in a matter of days, minimizing errors and speeding up your editorial workflow. For us, The Responsible Communication Style Guide is just the beginning. We’re experimenting with tools to create more inclusive writing, as well as to make this information more accessible to writers all over the world. Let us know if you have an idea for a new tool.